So says Linda Heincke, chief project manager at CGI. So it will be CGI that will deliver a new joint financial management system to LiU. LiU currently uses three different systems for financial processes: Proceedo for procurement, Palette for electronic invoice management, and the Agresso financial management system. “Our system, Raindance, can cover everything,” Ms Heincke says. “It’s a web-based, user-friendly, overall solution. CGI has several other universities and public organisations as clients. “Most recently, we’ve just finalized a similar project at Lund University. And the Södermanland county council is also one of our bigger customers,” Ms Jonsson says. After a kickoff, the project is now starting at LiU with a design and analysis phase. After the design and analysis phase, the system will be implemented over the summer. Over the fall, it will go through testing and then there will an opportunity to make changes. Training for end users will start in the late fall, and continue until summer 2017. And there are many of them – for example people who handle invoices, order goods and services, and make budgets. The switch to Raindance will take place at the beginning of 2017. But the old systems won’t be shut down then - on the other hand, everyone will start working in the new system. Training will continue at the same time. “The entire project will last for a year and a half. After that, our customer service will be available for support,” Ms Heincke and Ms Jonsson say. CGI is a Canadian company with 70,000 members – as their employees are called – around the world. The Swedish company WM-Data, initially purchased by Logica, was in turn bought a few years ago by CGI. The company has offices in many places around Sweden, including at Mjärdevi in Linköping. 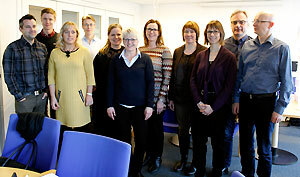 Pictured are the process coordinators from LiU and the representatives from CGI.